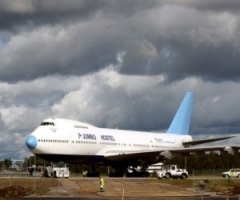 Welcome onboard the world's first Boeing 747-200 Jumbo Jet converted into an up market unique stay for the discerning traveler! 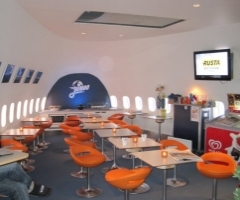 Jumbo Stay and Jumbo Bar & Restaurant is only a 6 minute ride with the free shuttle bus from the terminals at Arlanda airport. Perfect for anyone catching an early flight and does not want to get out of bed before dawn to make it to the airport in time. Now you can easily book a night at Jumbo Stay prior to your departure for an extraordinary experience before beginning of your trip - as well as relaxation. Jumbo Stay offers 29 comfortable rooms with single, two and three bed private rooms or two and four bed dormitories. 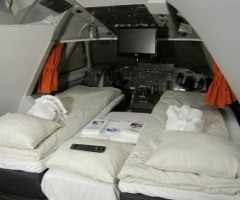 All together, the hostel offers 61 beds; the most luxurious is to be found on the planes upper deck which boasts an exclusive Cockpit suite with private shower and toilet. The rooms are approximately six square meters in size and measure nearly four meters from floor to ceiling. Each room has a flat screen TV. Everywhere in the jumbo jet you have access to wireless broadband. Jumbo Stay is also equipped and fitted with five modern bathroom and toilet facilities on the main deck, which are also accessible for handicapped guests. Jumbo Stay is open and staffed 24 hrs around the clock by one of the Jumbo crew members, to make it convenient for guests leaving and arriving at different times. We also sell food, light snacks and beverages at our Jumbo Bar & Restaurant. For those who have brought their own food we have two microwave ovens available for your convenience. Breakfast is served from three o'clock in the morning. Gisela Olsson, Site Manager Jumbo Hostel.